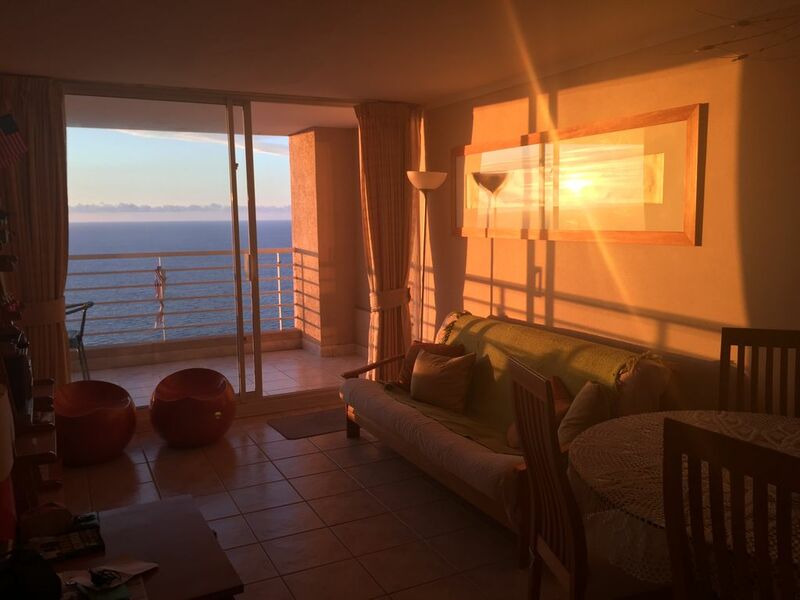 Our beachfront apartment has 2 bedrooms and 2 full bathrooms, with an open-style living, dining, and kitchen. The large balcony offers unobstructed views of the ocean, Valparaiso skyline to the left, and the sand dunes of ConCon to the right. The apartment is fully-furnished and equipped, building has upscale amenities, and it's prime location - all make our apartment an ideal home away from home. The master bathroom is full-bath, and features an option to be closed off from the apartment (private use). The apartment bathroom is a full-bath. Available in winter months through a preset/established setting done by the apartment administrator. All are professionally cleaned prior to arrival and upon checking out. Building features coin-operated machines, in a first-come-first-serve basis. Check with doorman in the lobby of Tower D.
Building features free wifi access ONLY in the main lobby areas of towers B & D. Tables/chairs are available to work/connect comfortably. Bath towels are provided, based on the number of guests. Building features a shared gym/fitness room. Detergent may be available but renters need to provide. Two flat-screens are hung, one in living room and the second in the master bedroom. Basic cable is available through Chile's TVR cable company. Building features a common area/game room with a television and access to buildings free wifi - only available in lobby's B and D.
Building offers for a fee - please check with doorman of tower D for details. Excellent place to visit the area! Our visit was just fabulous. Bonnie answered every question we had during the booking phase and was super helpful. The property manager met us to check-in/check-out and was available to answer any questions we had during our stay! The unit was very clean and fully stocked with everything we needed for a great stay with our family. We also enjoyed the pool area as well. The view is just spectacular - we were there during New Year's Eve, however, we took an easy walk down to Renaca beach and watched the fireworks from there, although you would have been able to see them from the unit. I highly recommend this rental as a place to stay to explore this beautiful area of Chile. Amazing place! It was spectacular! We had a great stay. The owner and host were beyond helpful and so nice since the first moment we contacted each other. The information was always clear and the check in was easy and smooth. The host was so nice and she waited for us patiently until we got to the apartment. I'm so happy with our stay! It was unbelievable since the location is the best spot! Thank you for all you did and for making our stay wonderful. Wonderful. Perfect location and well stocked and maintained. I give this property an 11. It was a great location and it had a wonderful view. I got sunburned because all I wanted to do was sit out on the deck and enjoy the surroundings. Bonnie is an amazing host. She went above and beyond in helping make our stay comfortable and enjoyable and she is extremely responsive. If you have a chance, I highly recommend going during New Years Eve. The fireworks display from the deck was a once in a lifetime experience. We have stayed in many condos and apartments all around the world and this may be the prettiest place we have ever stayed. I also really liked how there were restaurants with views right below the condo and a grocery store above after walking up a steep hill. In order to confirm your rental dates, 50% is required to book. The remaining 50% balance will be due in U.S. Dollars 7 days prior to check-in. The apartment manager will give a tour of the apartment and building. Your check-out time will be locked-in to ensure the apartment is found in the same condition as when arrived. If all is cleared, your security deposit of $250 will be returned 7 days after your check-out date. Any booking cancellations must be made 7 days prior to check-in to receive a refund of your 50% booking deposit.